Johann Peter Rupert (born 1 June 1950) is a South African-born entrepreneur, who is the eldest son of business tycoon Anton Rupert and his wife Huberte. He is the chairman of the Swiss-based luxury-goods company Richemontand the South Africa-based company Remgro. As of 1 April 2010, he assumed the CEO position of Compagnie Financiere Richemont. Together with his family, he was estimated to be worth $5.9 billion as of April 2019[update], and was ranked as the second wealthiest person in South Africa on the Forbes Rich List for 2019, with his fortune reported as having declined from US$7.3 billion. Rupert grew up in Stellenbosch, where he attended Paul Roos Gymnasium and the University of Stellenbosch, studying economics and company law. He dropped out of the university to pursue a career in business, however, in 2004, the university awarded him an honorary doctorate in Economics. In 2008, he was awarded an honorary doctorate in Commerce from Nelson Mandela Metropolitan University. Described as "reclusive" by the Financial Times and Barron's, Rupert rarely gives interviews and shuns public events. In 2006 the same newspaper also called him "Rupert the Bear" for predicting a world economic crisis. Rupert served his business apprenticeship in New York City, where he worked for Chase Manhattan for two years and for Lazard Freres for three years. He then returned to South Africa in 1979 and founded Rand Merchant Bank of which he was CEO. 1984: Merged RMB and Rand Consolidated Investments, forming RMB Holdings, and left to join his father's company, the Rembrandt Group. 1988 Founded Compagnie Financiere Richemont in 1988 and was appointed Non-Executive Director of Rothmans International plc in 1988. He was named "Businessman of the Year" by the Sunday Times in the same year. 1989: Appointed Vice Chairman of the Rembrandt Group. 1990: Named business leader of the year by Die Burger newspaper and the Cape Town Chamber of Commerce. Formed Richemont subsidiary Vendôme Luxury Group SA. 1991: Appointed Chairman of Rembrandt Group Limited and in 1992 he was named one of 200 "Global Leaders of Tomorrow" by the World Economic Forum, Davos, Switzerland. 1993: Received the M.S. Louw Award from the A.H.I. ("Afrikaanse Handelsinstituut"). 1996: Named Sunday Times Business Times's Businessman of the Year for second time. 1997: Appointed Non-Executive Chairman of Gold Fields South Africa Ltd.
1999: Awarded the 1999 Free Market Award by The Free Market Foundation of South Africa. 2004: Awarded an Honorary Doctorate in Economics by the University of Stellenbosch. 2008 Voted South Africa's Business Leader of the Year by the CEOs of the Top 100 Companies, for the third time. Selected as the 2009 International Wine Entrepreneur of the Year at the Meininger "Excellence in Wine and Spirit" awards ceremony in Düsseldorf, Germany. Rupert has declared his sympathy for and belief in the idea of a universal basic income. Rupert is a former cricketer and founded the Laureus Sport for Good Foundation in 1990. Laureus funds 65 projects globally, with the goal of using sport to tackle social issues, having a particular emphasis on underprivileged children. He co-founded the Sports Science Institute with his friends Morne du Plessis and Tim Noakes. Rupert also developed the Gary Player designed, Leopard Creek Golf Club in Mpumalanga, South Africa which is one of South Africa's top three golf courses, and rated number 25 outside the United States of America (Golf Digest). He has also played in the annual Gary Player Invitational golf tournament to assist fellow South African and friend Gary Player raise funds for various children's charities. He serves as Chairman of the South African PGA Tour and Chairman of the South African Golf Development Board. In 2007 he was elected into South African Sports Hall of Fame and in 2009 was inducted into South African Golf Hall of Fame. Following his younger brother Anthonij's death in a car accident in 2001 he took over the L'Ormarins wine estate. Anthonij, was head of Rupert & Rothschild Vignerons. Rupert initiated a project to enhance the farm in memory of his late brother. He was council member of The South Africa Foundation and trustee of the Southern African Nature Foundation, The Institute of Directors in Southern Africa, Business South Africa and Die Suid-Afrikaanse Akademie vir Wetenskap en Kuns and Managing Trustee and member of the investment committee, Nelson Mandela Children's Fund. He served on the Daimler Chrysler International Advisory Board. Following in the footsteps of his father, Anton, Johann Rupert is also a committed conservationist. In addition to conserving about 25,000 hectares in the Graaff Reinet area, he is also Chairman of the Peace Parks Foundation. When the British design magazine Wallpaper* described the Afrikaans language as "one of the ugliest languages in the world" in its September 2005 edition (in reference to the Afrikaans Language Monument), Rupert responded by withdrawing advertising for his companies' brands such as Cartier, Van Cleef & Arpels, Montblanc and Alfred Dunhill from the magazine. In December 2016, it was reported that Rupert had dropped Bell Pottinger as the PR agency of Richemont, accusing Bell Pottinger of running a social media campaign against him, to divert attention away from persistent 'state capture' allegations levelled at the Gupta family. In February 2017, Rupert alleged that Bell Pottinger had maliciously altered his Wikipedia page. Rupert e-mailed his friend Jimmy Wales, the Wikipedia founder, to revert the alterations made to his Wikipedia page. In September 2017, Rupert, during Richemont’s annual general meeting in Geneva, described the use of the term "Radical Economic Transformation" by Bell Pottinger as "just a code word for theft”, in order to cover up the "State Capture" by their clients, the notorious Gupta family. Radical Economic Transformation is a policy championed by President Jacob Zuma to reduce racial inequality in South Africa. In 2018 Rupert caused some controversy in South Africa for comments he made during an interview with PowerFM. He was criticised for denying the alleged existence of white monopoly capital, his account of the process of Afrikaner economic-upliftment, and for comments he made regarding the saving habits of black South Africans. Following the incident Rupert issued an apology for his comments. The controversial leader of the Black First Land First party Andile Mngxitama stated afterwards that Rupert's comments were a reason to commit violence against white South Africans. ^ a b c "Johann Rupert". Retrieved 12 April 2019. ^ "5 South Africans on Forbes’ list of the richest people in the world", Business Tech, March 6, 2019. ^ "Chancellor". sun.ac.za. Retrieved 13 October 2015. ^ "Synchronised Speakers | Johann Rupert". synchronisedspeakers.co.za. Retrieved 13 October 2015. ^ "Meininger Award 2006". Archived from the original on 25 March 2008. Retrieved 27 July 2012. ^ "Chancellor - Profile of Dr Johan Rupert". Sun.ac.za. Archived from the original on 11 October 2012. Retrieved 27 July 2012. 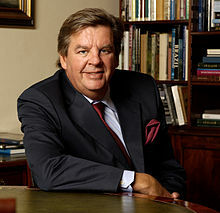 ^ "Johann Rupert becomes Honorary Life Vice President". European Tour. 23 May 2010. Retrieved 27 July 2012. ^ "2010". St-andrews.ac.uk. 13 July 2010. Retrieved 27 July 2012. ^ "Richemont founder backs universal basic income". Financial Times. Retrieved 2018-01-24. ^ "Home". Ssisa.com. Retrieved 27 July 2012. ^ "Class of 2009 inductees". Karlkoof Safari Spa Southern Africa Golf Hall of Fame. 17 February 2017. ^ "Peace Parks Foundation Structure". Peace Parks Foundation. 17 February 2017. ^ Carlos, Amato (16 Feb 2017). "Johann Rupert on being cast as the poster boy of 'white monopoly capital'". businesslive.co.za. Retrieved 16 February 2017. ^ "Johann Rupert on being cast as the poster boy of 'white monopoly capital'". Retrieved 2017-11-09. ^ "Johann Rupert: Radical economic transformation just a code word for theft". Fin24. Retrieved 2017-10-15. ^ Mjo, Odwa (5 December 2018). "Johann Rupert and the interview that went so wrong". www.timeslive.co.za. Retrieved 2018-12-18. ^ John Bowker and Loni Prinsloo (2018-12-06). "White monopoly capital according to Johann Rupert". Fin24. Retrieved 2018-12-18. ^ Bateman, Chris (2018-12-07). "Rupert's had enough of his detractors – what it could mean". BizNews.com. Retrieved 2018-12-18. ^ "'Apology, no insult intended': Johann Rupert takes to Twitter to apologise for comments made in PowerFM interview". News24. 2018-12-05. Retrieved 2018-12-18. ^ Zulu, Makhosandile. "Mngxitama says killing whites and their pets is a response to Johann Rupert". The Citizen. Retrieved 2018-12-18. ^ Dlulane, Bonga. "Agang SA condemns Andile Mngxitama's 'kill white people' comments". ewn.co.za. Retrieved 2018-12-18.